After last winter, it would be hard to find a homeowner who is not familiar with ice dams and the associated problems. The damage and headaches they caused throughout the northeastern United States kept handymen and contractors working overtime. Despite all the damage that ice damming can cause, it is easily prevented, but not as easily fixed. An ice dam is a ridge of ice that forms around the edge of a roof, sometimes on or near the gutters, that prevents melting snow from draining off the roof. Since the melting snow cannot effectively drain off the roof, the water often leaks through the roof causing damage to the insulation, walls, and ceilings. The moisture left by this leaking water often causes long term mold and mildew issues, which can lead to respiratory problems. Add ventilation to your attic. Ventilation to your attic will help maintain consistent temperatures along all parts of the roof. As shown in the picture above, have a soffit vent and a ridge vent on the top of the roof will allow outside air to freely flow underneath the roof. This will help prevent an ice dam from forming. Be sure to check these vents to ensure they remain free of debris, snow, or ice throughout the winter or they will not work as desired. Increase insulation in attic. This will prevent heat from inside your house from rising up into the attic and warming the roof. Special attention needs to be given to any vents that are in the attic. These vents can directly heat the attic if they are not properly insulated. Remove snow from the roof. If snow is removed from your roof, the primary ingredient for an ice dam is taken away. This is only a short term solution and can be dangerous, so be careful! I Have An Ice Dam Right Now, How Do I Fix It? Do not succumb to the temptation to simply knock down the icicles with a hammer or shovel! This can cause more damage to your roof. A roof rake or push broom should be used to remove any snow on the roof. As mentioned before, be careful! You can also melt through the ice dam with calcium chloride ice melter, but do not use rock salt as this will cause damage to your roof and gutters. One way to do this is to fill an old sock with calcium chloride and place it perpendicular to the ice dam. This will melt the ice underneath the sock and allow the built up water behind the ice a place to drain. -Check trees around the exterior of the house to be sure branches are not encroaching on power lines or other wiring. -Check the asphalt or concrete on the driveway, sidewalks and walking paths for cracks, which can be trip hazards allow water in that will do more damage over the winter. -Inspect porches and decks for loose railings or boards, damaged steps and sagging ceilings, being sure to make sure the posts are not loose or rotted and are still firmly in or mounted to the ground. -Examine retaining walls for loose areas or bulges, which could collapse with heavy rain or snowfall. Make sure drainage holes are clear of debris. -Make sure fences, stone/brick walls and gates are not leaning or damaged in any way, something that will become worse during storms and freeze-and-thaw cycles. -Check for stains on your home’s siding, which could be a sign of water damage or a gutter or roof issue. -Make note of any peeling paint, missing brick mortar or cracked stucco on the outside of your home. -Check the gutters and downspouts for debris and pitch problems, preferably on a rainy day. 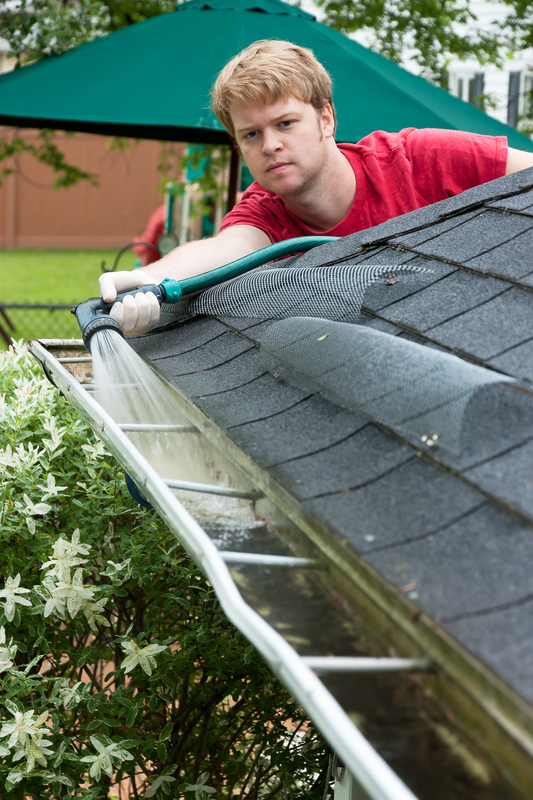 Listen for gutter spill-over and look for stains on the soffit that indicate signs of leakage. -Look for signs of insect, bird or bat nests in soffits, eaves and attic vents. -Make sure the foundation is free of cracks and bulges. -Scan the sill for signs of rot or insect activity. Be on the lookout for raised mud channels, a sure sign of termites. Use a sharp knife or other sharp object to check for wood damage. -Check for signs of leaks in areas where pipes run through the walls or foundation and on all pipes exposed to the elements. -Be sure the grade of the ground around the foundation of your home slopes away from the house. -Take a look at the roofing. Are there any cracks, missing shingles or crumbling pieces? Check asphalt shingles for dry, blistering, alligatoring or curling; wood for rot and cracks; slate and tile for broken pieces; and flat roofs for holes that may let in water. -Pay special attention to areas under trees, where falling branches or animals (like squirrels) can cause damage. Once the leaves have fallen, look closely at spots where branches touch the house. -Check the roof flashing, vents and chimney caps for damage or corrosion. -Examine the roof for moss, mildew and debris. -Make sure the chimney isn’t leaning on the chimney and check that the flashing around it is in good condition and doesn’t need sealing. -Keep an eye out for any signs of potential animal activity or entry points for critters (including bats). -Send a sample of well water to your county cooperative extension to test it for chemicals and bacteria, and make sure that the well cover is tightly sealed while ensuring the pump is still accessible. –Check the sump pump by pouring water on it, to see if it turns on automatically. -If you have a septic system, look around the tank or field for soggy ground or too much greenery, which could mean the tank is either full or failing. -Check the doors and windows for smooth operation, signs of swelling and sticking points. -Examine the weather stripping around exterior doors and windows for wear, tear and potential infiltration (wind, water and animals) points. -Check all windows for cracks in the glass and/or loose or missing glazing around panes. -Look for peeling paint and other signs of wear on window frames and stools, especially in the bottom corners. Check that weep holes in the bottom of the windowsill outside haven’t been caulked over, blocking drainage. -Take a look at thresholds for cracks that could let water reach the sill. -Check the garage door’s opening and closing action while scanning for cracks in its surface or dents in the tracks. -Be sure tool storage and hanging racks aren’t create a fall or trip hazard.